Many people would agree that England’s greatest export is probably the rock ‘n roll band, The Beatles – Lennon, McCartney, Harrison, and Starr, affectionately known as John, Paul, George, and Ringo. Now, England’s latest and greatest export has arrived in the U.S. It’s Downton Abbey: The Exhibition. 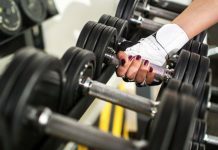 If you enjoyed watching Downton Abbey, the popular BBC-TV mini-series, in recent years on PBS, then you are probably suffering from withdrawal and missing those Sunday night episodes which were part of PBS’s Masterpiece series. Well, there’s great news to report. Downton Abbey is alive and well and on tour, so to speak, in the United States. Yes, the beloved television program — er, programme, as it’s spelled in Great Britain — is spending the winter in, of all places, West Palm Beach, Florida. 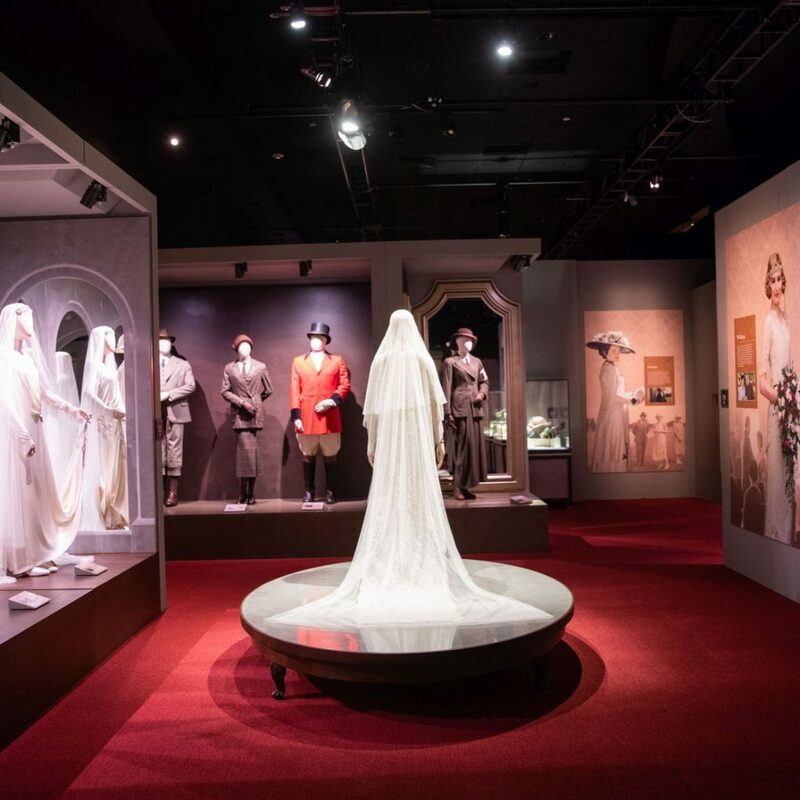 Beginning on November 10, 2018 and continuing until April 22, 2019, Downton Abbey: The Exhibition will be on display inside the former Macy’s department store at CityPlace in downtown West Palm Beach – 875 South Rosemary Avenue. This exhibit is a tribute to the six seasons of the popular TV series that attracted a loyal national and international following. 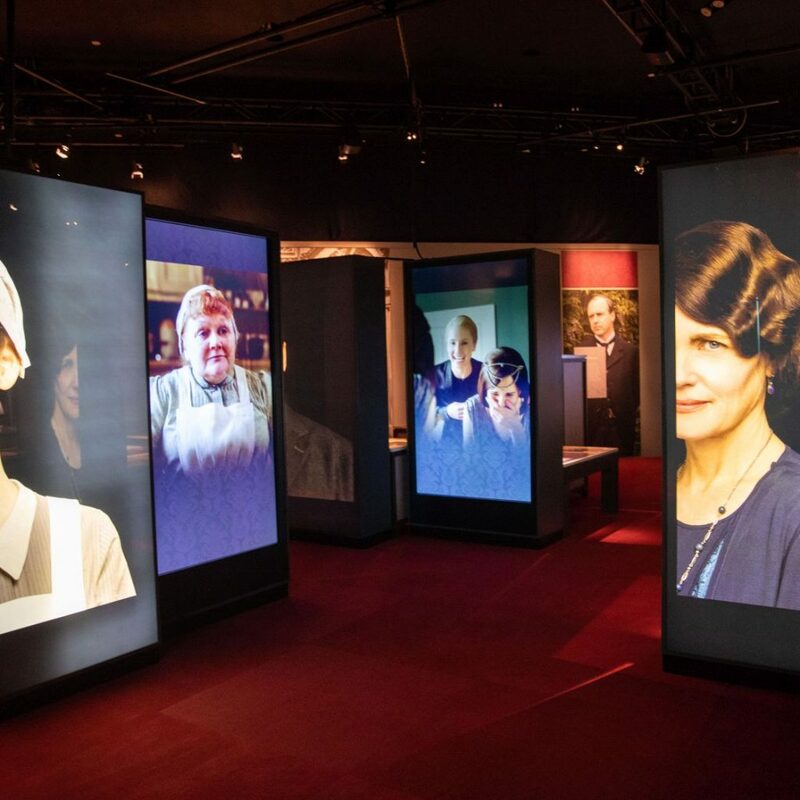 The existence of this exhibit brings Mr. Carson, Lord Grantham, Lady Cora, Lady Mary, Lady Violet, Mrs. Patmore, Mrs. Hughes, Mr. Bates, and others back to life. Downton Abbey: The Exhibition, a nine-room exhibit, is a fitting tribute to the workof Downton Abbey creator Julian Fellowes. 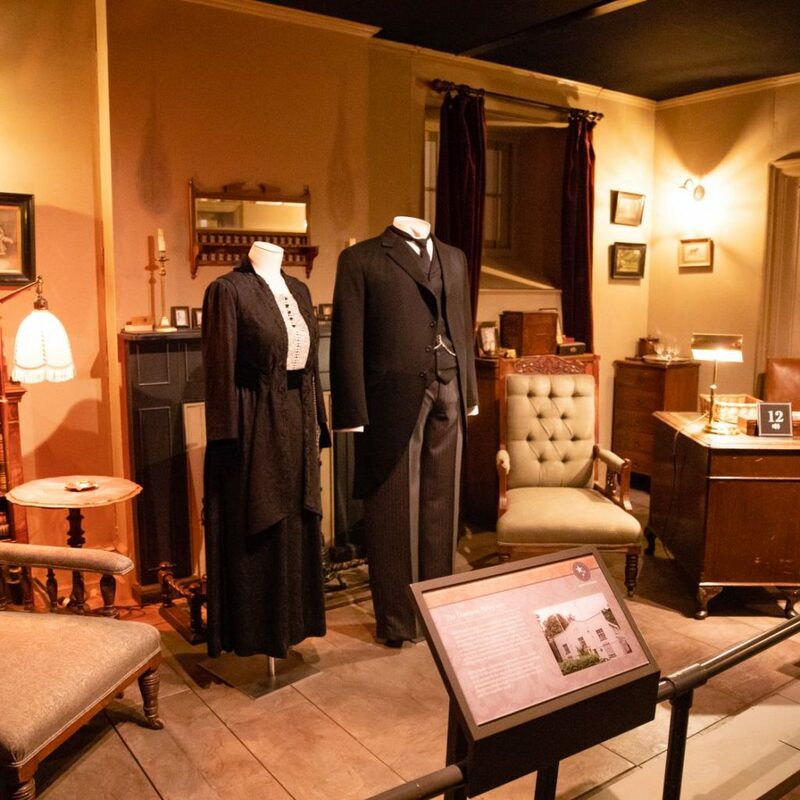 Based on the beloved television show, Downton Abbey: The Exhibition transports you to post-Edwardian England, where the characters and the iconic house come to life. You’ll be immersed in England’s fascinating social history and culture during that era, as well as some of the most memorable moments during the show. 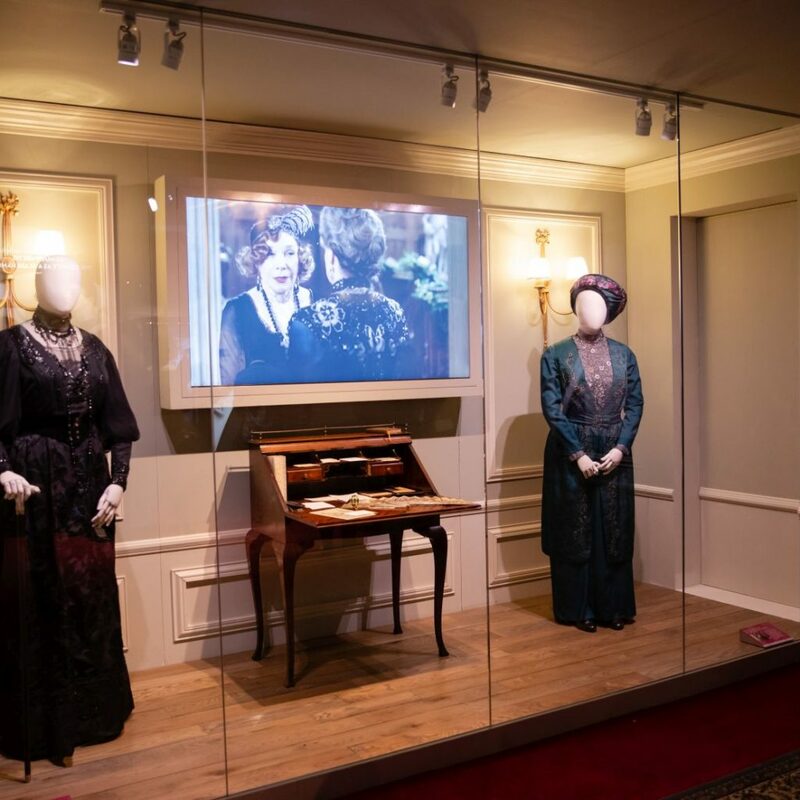 If you enjoyed Downton Abbey on the small screen, you will thoroughly enjoy this interactive exhibit, which has been assembled by Imagine Exhibitions, in cooperation with NBC. 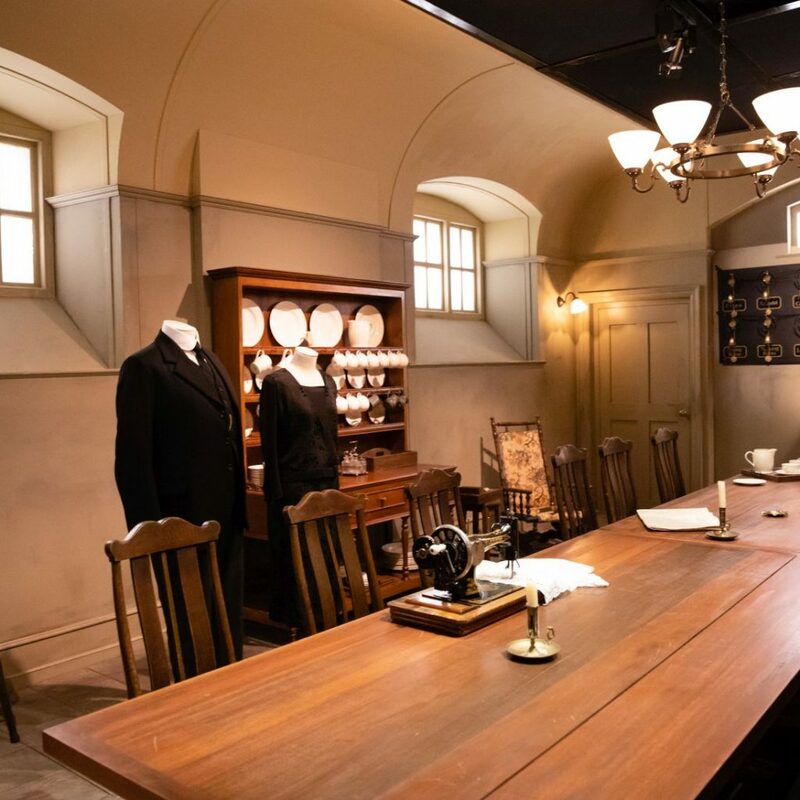 This exhibit’s attention to detail is to be applauded and is necessary in order to maintain the authenticity and integrity of the overall exhibit, such as Mrs. Patmore’s Kitchen, The Servant’s Quarters, Mr. Carson’s Pantry (his private office), The Library, The Servants’ Dining Hall, The Back Stairs, The Green Baize Door, Lady Mary’s Bedroom, and the Crawley’s Dining Room. Also on display are many of the clothes, hats, and accessories worn by the show’s cast of characters, including 60 costumes worn by the actors and actresses, 85 pieces of jewelry, and a number of actual props used in the show. 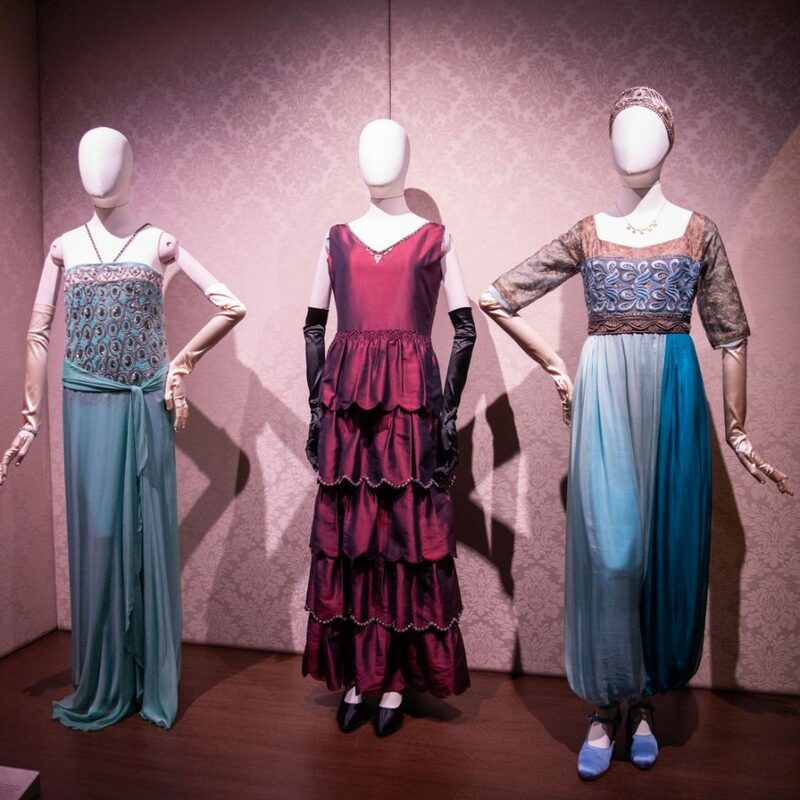 A few of the costumes include Lady Mary’s silver flapper-style evening gown, Lady Edith’s two wedding dresses, Lady Sybil’s antique-gold bodice and blue pantaloons, and Lady Crawley’s terra-cotta silk summer coat. On the desk inside Mr. Carson’s Pantry is the servants’ telephone and his special wine & port pouring device, which viewers will remember seeing, at times, during past episodes. The Green Baize Door has special significance because it divides the servants’ world downstairs from the Crawley family’s existence upstairs. 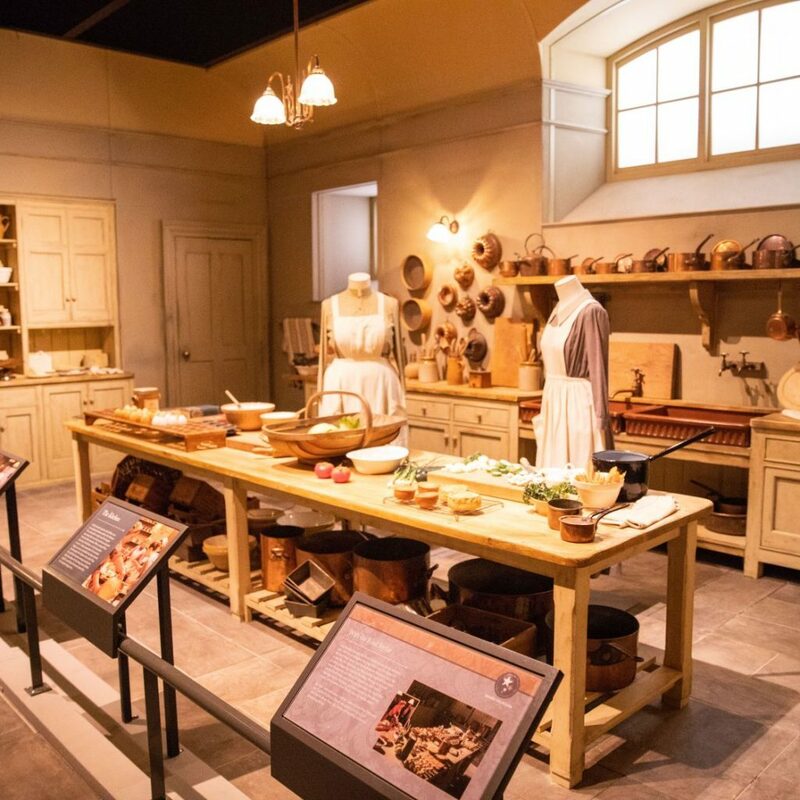 In Mrs. Patmore’s Kitchen, you’ll hear the noise of pots and pans being used as well as the sounds of chopping, slicing, dicing, and mixing in the background – probably being conducted by kitchen maids Ivy and Daisy. Obviously, the cast were too busy to talk as they were occupied preparing yet another first-class meal, but you hear the knives and cooking utensils making contact with the cutting boards. When you walk into The Servants’ Dining Hall, you can visualize Mr. Carson at the head of the table, just as Lord Grantham always took the lead at every dinner held upstairs. In The Servant’s Quarters, take note of the bell board on one of the walls where there are 20 bells affiliated with 20 parts of this prestigious home – the Study, Front Door, Back Door, Drawing Room, West Room, Library, Arundel, Chinese Room, Stanhope, Grantham, Small Library, Morning Room, Dining Room, Saloon, Nursery, Princess Amelia, Mercia, Portico, Queen Carolina, and Fontenoy. When the Crawley family needed help, assistance was just a bell ring away. 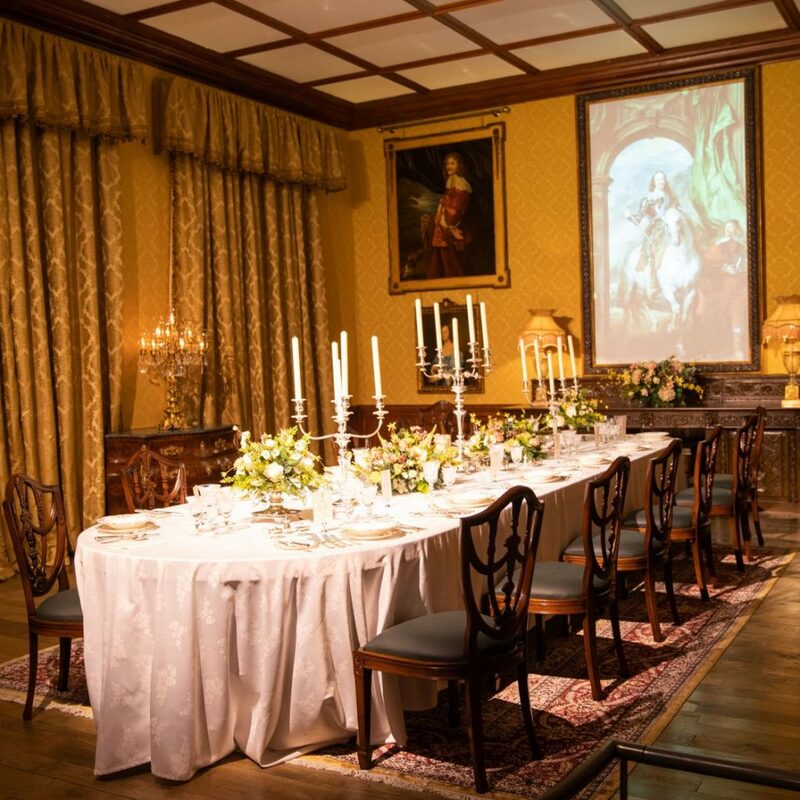 At Downton Abbey: The Exhibition, The Crawley Dining Room is set for 12 guests. Each table setting features four forks, four crystal glasses, three knives, and two spoons. 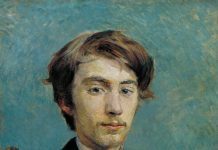 On the wall, you’ll see 11 portraits. Meals inside Downton Abbey were never dine-and-dash experiences. It would be fun to be a guest at dinner one evening with the Crawley family. You begin and end this exhibit with the showing of a video. The first video welcomes you and the final video thanks you for visiting Downton Abbey: The Exhibition. 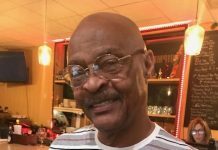 In both videos, Mr. Carson plays a lead role. In the opening video, Mr. Carson reminds visitors of the ground rules. Mr. Carson also doesn’t shy away from providing a critique of each visitor’s wardrobe selection. “I am slightly surprised by the clothes that some of you have decided to wear today,” said Mr. Carson in his pre-recorded message. His dry sarcasm always evokes a smile and a chuckle from the die-hard fans who gather for one more Downton Abbey experience. The first room that you enter is the Great Hall and you are greeted by a docent who will explain your immediate surroundings. You’ll also hear background music from the show that stays with you for much of your visit. The music sets the tone for your escape to another country in another era. Here, you are introduced to nearly every character on the show, as well as many of the accessories, trinkets, and props used or worn during many of the episodes, such as the handcuffs used to arrest Mr. Bates for the murder of his estranged wife Vera, Mrs. Hughes to-do list, Lady Rose’s flapper girl jewelry, Lady Sybil’s wedding band, Tom Branson’s watch and cufflinks, and the driving gloves, cap, and goggles worn by Henry Talbot, who ends up being Lady Mary’s second husband. Each character introduction in the Great Hall features a large image of each actor or actress, as well as a short description of that character’s background and career path. You’ll be delighted to discover that Mr. Carson was once a member of a song-and-dance troupe called the Cheerful Charlie’s. Despite his unique, free-wheeling background, it’s clear that Mr. Carson, now a mature adult, feels strongly that his key responsibility at Downton Abbey is to defend the reputation of the Crawley home and family — at all times, with dignity, integrity, and honour. (another British spelling!). It’s also worth noting that there is a caring aspect to Mr. Carson, as you recall, who expressed fatherly love for Mary and, of course, romantic love for Mrs. Hughes at the end of season six. The Great Hall is the most interactive aspect of the overall exhibit. Exhibit officials actually encourage you to touch, try, and feel everything that’s on display such as the Crawley family toaster, radio, electric whisk, and phonograph. There are also displays which give you background information on each significant character in Downton Abbey. One of the eye-opening factoids is the fact that Mrs, Patmore was not allowed to get married due to the high demands of her job running the kitchen in the Crawley family home. Even though not married, women like Mrs. Patmore and Mrs. Hughes earned the title Mrs. because of the respect their professional position earned them in life. Before you leave the Great Hall, there’s a video wall featuring a variety of entertaining sound bites by Maggie Smith in her role as Lady Violet, the Dowager Countess, the Crawley family matriarch. One memorable scene was the obvious level of embarrassed discomfort by Lady Violet when she met again with Prince Kuragin, her lost love from Russia from the previous century. “You’ll find there’s never a dull moment in this house,” said Lady Violet, in one of her many cheeky comments made during the six-year run of the show. Lady Violet’s character can best be described as being filled with wit, charm, dignity, and rudeness. “War has a way of distinguishing things that matter and those that don’t,” said Matthew Crawley. He was right then and he would be right today. “I’ve given my life to Downton. I was born here. I hope to die here,” said a passionate Lord Grantham, during the six-year run of Downton Abbey. It’s also worth remembering that a new Downton Abbey movie is scheduled to be released in September of this year (2019). It might be fair to say that the best of Downton Abbey is yet to come. And, Downton Abbey: The Exhibition is as good as it gets and the next best thing to being there. If you want to really enjoy your Downton Abbey experience in a first-class way, you should strongly consider concluding your excursion with a traditional British-style afternoon tea at The Chesterfield Palm Beach luxury hotel, which is in nearby Palm Beach. In addition to a wide selection of teas, you’ll be served a variety of finger-style sandwiches and an array of delicious desserts, all served on a three-tiered pastry tray. The salmon sandwiches are as good as you would expect and the cucumber sandwiches are delightfully elegant, and tasty, too. Your dining experience will include authentic British scones, which will be served with clotted cream and strawberry preserves. When you leave The Chesterfield Palm Beach, you won’t be hungry. Give this option serious consideration. 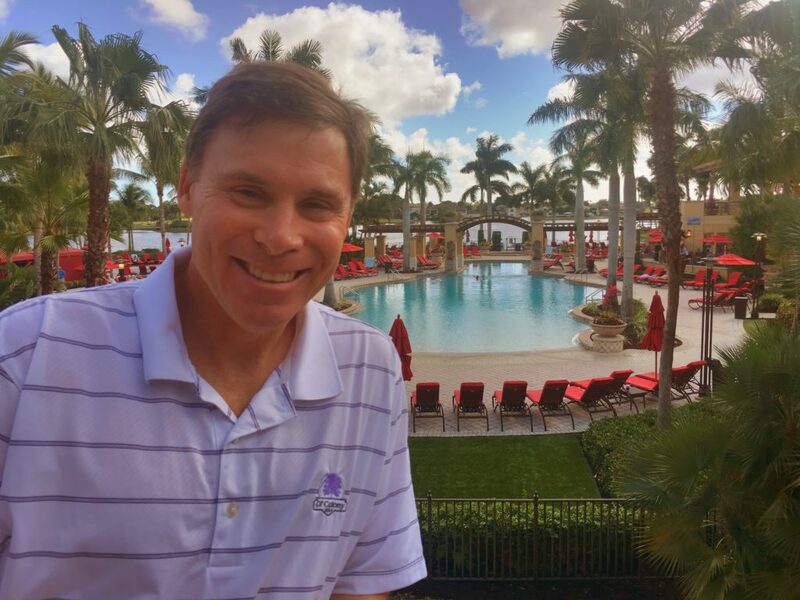 If you choose The Chesterfield Palm Beach experience, Mr. Carson would definitely approve and Lady Violet wouldn’t have it any other way! To book your Downton Abbey afternoon tea experience at The Chesterfield Palm Beach, call 561-659-5800 ext. 154. To purchase your tickets to the Downton Abbey exhibit in West Palm Beach, call 866-811-4111 or visit the website www.downtonexhibition.com. The exhibit is open from 10:00 am to 7:00 pm daily. Tickets cost $35 apiece and there’s a 10% discount when there’s a group purchase of ten or more for a weekday visit. Children under the age of 14, who are accompanied by a paying adult, are free. Spending a few extra bucks on the audio guide is highly recommended. So, who is England’s greatest export? Is it Lennon, McCartney, Harrison, and Starr or Mr. Carson, Lord Grantham, Lady Violet, and Lady Mary (and others)? 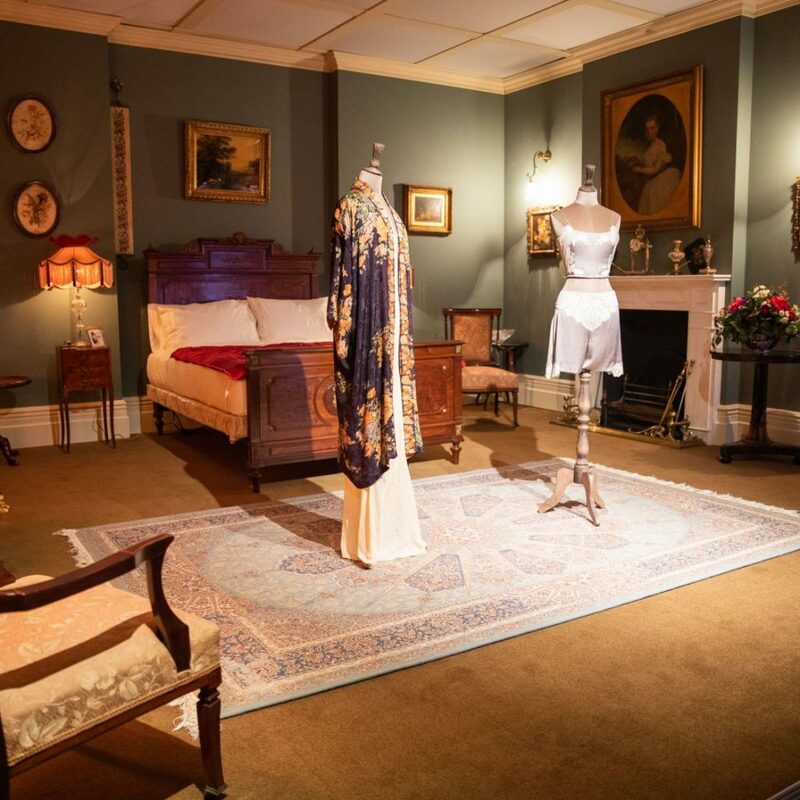 Go visit Downton Abbey: The Exhibition and make your own decision. I’ve made mine and the lads from Liverpool finished second. No discussion needed. Just let it be!